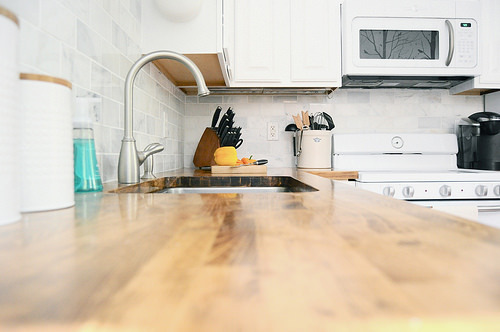 Most real estate agents will tell you that a kitchen can make or break a home sale. The kitchen has often been called the heart of the home and is usually the main hub for family activity. It only stands to reason that if you spend a lot of time in this room, you want it to be beautiful and filled with the things you love. 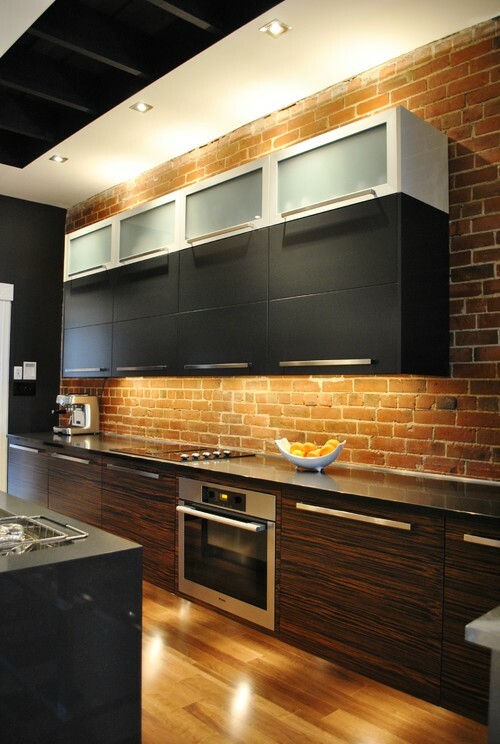 Do you like the edgy industrial style of exposed brick, metal, and concrete? Your kitchen experts can use brick facing instead of mosaic tile for a truly unique backsplash. To complete the look, you can pair it with concrete countertops. To do it, the contractors pour fine grade cement into counter-molds that fit the top of your cabinets. They can add coloring for an interesting contrast. After they are dried and sealed, you have durable countertops that complement your industrial look. 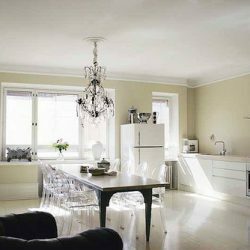 These services are available in the backsplashes stores in New York, Manhattan, Brooklyn, and in our Queens store. White subway tiles are iconic for backsplashes. They get a modern boost when you match them with light granite or quartz countertops. For a unique twist, your contractor can apply the subway kitchen wall tiles in a herringbone pattern. 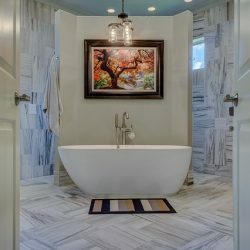 If you like the looks of subway tile and do not want white, you can get them in a variety of modern colors. Aged orange or yellow tiles can add a Mexican flair to your design. You can even mix and match the colors to create a unique mosaic tile for your backsplash. The experts in the countertop and backsplashes stores in New York can show you how gorgeous your kitchen can be. If you want your kitchen to have clean lines and a totally modern edge, you will love painted glass tiles for a backsplash. The manufacturers paint the backs of durable glass panels the color of the client’s choice. These painted glass tiles give a colorful mirrored effect to the room. This style is often paired with quartz, caesarstone, or even butcher block countertops. Have you ever admired the rustic beauty of foreign kitchens? Your countertop and backsplash store in New York can show you different pairings to get the look you want. Blending multicolored mosaic tile for a backsplash can be the inspiration for several exotic looks. 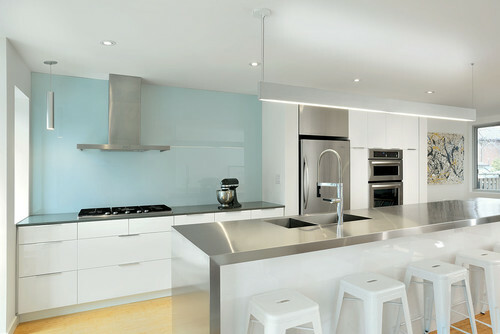 You can use blues, whites, and silvers paired with caesarstone countertops for a lovely Persian feel. If you blend blues, yellows, and green kitchen wall tiles with light granite countertops, you can achieve a rich Moroccan style. It all depends on the colors that your contractors use and your accent pieces. This popular style is a blend of primitive and classic French provincial. White subway tile backsplashes are often used for these kitchens. However, you can also use earthy blends of sand, sage, and cream for the iconic French look. Many clients pair this type of backsplash with butcher board for the rustic feel. Others choose light soapstone because it highlights their farm sinks. If you want a deep contrast with the whites and creams of your shaggy chic kitchen, you can also go with black granite. Your contractor will work with you to achieve the style you want.